Missouri’s growing season typically runs from April to October and, depending on where you live can make a big difference when to expect your first or last frost. Missouri’s latitudinal variation, the Ozark Plateau, river bottomlands, hills, valleys and populated areas are all factors contributing to frost potential. If you have an established climate record of temperatures for your region, and an idea of how local topography can affect temperature, you can use that knowledge in determining when, on average, to expect your first and last frost. Typically, the first fall frost (≤ 32°F) occurs over northern and central Missouri by the second and third week of October, respectively. Similarly, the last spring frost occurs over northern and central Missouri by the third and second week of April, respectively. Frosts are more likely to be experienced earlier in the fall or later in the spring over the Ozarks when compared to central Missouri. The reason for this is due to the higher elevation of the Ozark Plateau which causes cooler temperatures in the Ozark region. As the Ozark Plateau transitions to the Southeastern Lowlands of the Bootheel, the average first fall frost generally occurs between the last week of October and the first week of November. Similarly, the average last spring frost varies from the second week of April to the end of March. Another item to consider is local terrain where temperatures can be highly variable over small distances due to topography. This resource provides a generalized view of expected last spring and first fall frost dates. Minimum temperatures can vary 10°F or higher over a short distance, say, from the bottom of a valley to a nearby hilltop. Cool air, being denser than warm air, moves down the slopes of hills, accumulating in the valleys. This is why low lying areas, such as river bottoms, will likely be colder than their surroundings on clear, calm nights. Therefore, while referring to the data and maps throughout this site, consider your local landscape when determining your average first frost date. 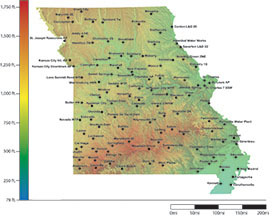 This website provides frost/freeze probabilities, tables, maps and dates for 103 National Weather Service Cooperative Weather Stations in Missouri. The information was obtained from the National Center for Environmental Information and is based on data for the 30-year period 1981-2010. The median date point maps provide the last spring and first fall median frost/freeze dates for specific temperature thresholds, i.e.36°F, 32°F, 28°F and 24°F. In this application, median date is defined as the date where there is a 50% chance a specified frost/freeze temperature will occur before or after the designated date. The median date contour maps use the same data as the median date point maps, but with contoured regions of the state. The extreme date point maps provide the latest spring and earliest fall frost/freeze dates using only weather stations with a nearly continuous long-term history of temperature observations, i.e. ≥ 100 years. The weather station map and probabilities table displays a complete data table with probability thresholds for all the weather stations in the state. If you want to search for a location nearest you, please use the weather station search tool. We hope you find this information useful for your plant sensitive management decisions. Published by the Integrated Pest Management Program, 110 Waters Hall, Columbia, MO 65211 | ipm@missouri.edu.